Huge Savings Item! Free Shipping Included! 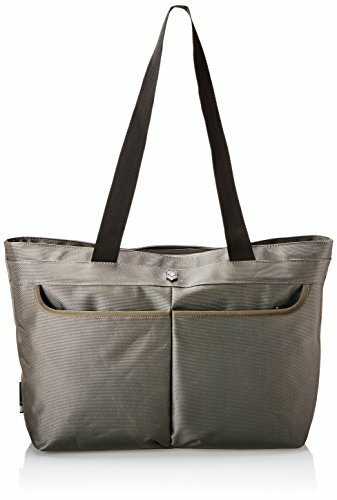 Save 15% on the Victorinox Werks Traveler 5.0 WT Shopping Tote, Olive Green, One Size by Victorinox at Just Gathering. MPN: 323011. Hurry! Limited time offer. Offer valid only while supplies last. The perfect size for a carry-on or everyday bag, this tote contains storage for a water bottle or umbrella, a tablet or E-reader and lots more. The perfect size for a carry-on or everyday bag, this tote contains storage for a water bottle or umbrella, a tablet or E-reader and lots more. Spacious tote is the perfect size for a convenient carry-on or everyday bag. Interior features two padded electronics pockets sized to fit a tablet or E-reader, two mesh peripherals pockets, a key fob, a water bottle/umbrella pocket and a full-length zippered lining pocket. Exterior features two zippered storage pockets. Rear pocket converts to a sleeve for sliding over the handle system of wheeled luggage. Two wide, webbing straps allow for carrying by hand or over the shoulder. Global lifetime plus limited warranty- for five years from the date of purchase this warranty covers functional damage caused by common carries such as airlines, taxis, trains and cruise ships, as well as defects in materials and workmanship. Should a defect or damage appear under normal used during the first five years of ownership, we will repair or replace your product as appropriate at our discretion. For years six and beyond the product is guaranteed to be free from defects in materials and workmanship. See victorinox.com for full warranty details.